This is my adventure into creating an art installation for the Art in Rural Storefronts project sponsored by The Arts Center of Corvallis. ARS serves regional audiences in Linn and Benton Counties by bringing innovative, thought- provoking art projects to rural communities that lack spaces dedicated to contemporary/non-commercial art. Three artists were chosen to participate. Art in Rural Storefronts is a collaboration between The Arts Center and Rural Development Initiatives. The project is funded in part by the Oregon Arts Commission. When I made my proposal, I had several ideas about how to cover the wire squares. One idea was to use seed bags used by the local grass seed growers. On further investigation, I learned many bags are now created using woven plastic (tough for me to glue quickly). Not a good route to take. Plan B incorporated valley dirt to color a white paper. After checking out our valley river loam, I determined it would not create good dye. I would need to use some pretty heavy paper to hold up to a long mud bath. Scratch that idea! What do I do now? What natural dye material is found around farm fields or farmers homes that could color light weight paper? Walnuts! Ok. It’s not fully related to the fish or grass seed, but the old graceful trees are often found next to the farm houses. I spent a little time picking up fallen walnuts in the area, some with green coatings while others had already started to deteriorate into a dark brown mess. 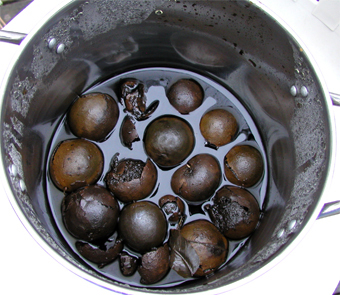 I tossed them into a pot, filled with a gallon or so of water and boiled for 20 min. There was an art critique meeting that night so I shut off the heat and left the pot covered on the stove. 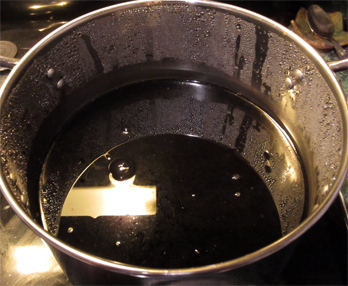 Poor Dave came home to a pot of black inky something with green monster eyeballs floating amongst the darkness. Definitely not dinner! How far should the reduction go? I wasn’t certain if the 20 min of heat would produce a dark enough color so a quick test was done. 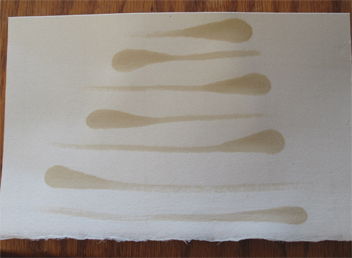 A scrap of Hosho paper received a few brush strokes from the liquid. The paper was much thicker than what will be used for the project. Will it be enough? I’ll give it a go for now. If I need it darker, I’ll reduce my stock in half. 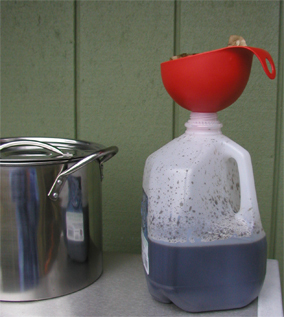 The brew was cooled for over 24 hrs then strained using a coffee filter, funnel and empty plastic water jug. 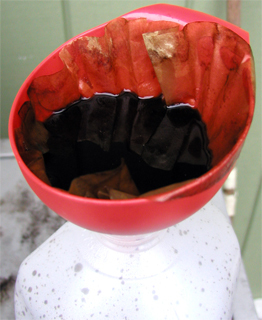 The coffee filter helped remove extra walnut fiber sludge from the water. 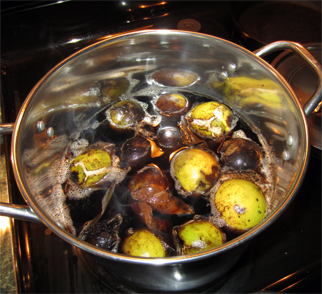 Will this be enough to dye all the paper needed? Time will tell.